Looking for state-of-the-art flooring installation with a company you can trust? Burns Flooring & Kitchen Design specializes in high quality, long lasting tile and hardwood options. Making a decision for the type of floor installation can be difficult. 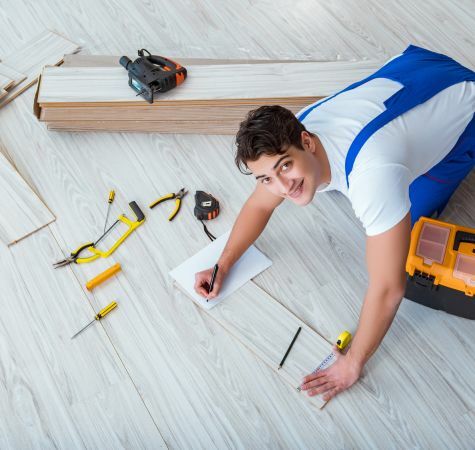 Our installation team will assist you with concerns like how much traffic will be on the floors on a regular basis, the type of flooring you would like, tile or hardwood, cost, and the longevity of the materials. Our professionals at Burns Flooring & Kitchen Design specialize in helping customers make the right decisions so they are satisfied from the type of floors to the most affordable option. We will work with any builder or individual for residential or commercial floors and help choose the best installation possible. We can provide beautiful options for bathrooms, kitchens, dining rooms, office areas and more. We ensure not only high quality materials for tile and hardwood but also a high quality installation. At Burns Flooring & Kitchen Design we strive for an amazing outcome our customers will be happy with for the lifetime of the flooring. Burns focuses on providing a high quality floor you can live on for years to come. Tile and hardwood floor installation is often a task many people decide to do on their own, and often suffer financial consequences. Burns Flooring & Kitchen Design will not only work with you on choosing the right high quality option, but also install it for you. Our professional installers provide amazing residential or commercial floor solutions for every type of floor. We get the job done right the first time. Hardwood floors are very difficult to install yourself. You can rest assured our fast and friendly staff is professional and will lay out exactly what you were hoping for. Call our experts today at one of our three locations and we will be happy to help you choose the right floor solution. We serve customers in Lakeland, Poinciana, Lake Wales, Haines City and Bartow areas.